""Kamby Bolongo Mean River" may just tie both your brain and stomach into knots." --John Madera, "Word Riot"
""Part of the World" is a gripping read, ominous, blackly hilarious and psychologically acute." --Jason Jones, "Mid-American Review"
Robert Lopez has collected twenty-nine short stories, running from the very short on up to a novella in shorts to close out the book. 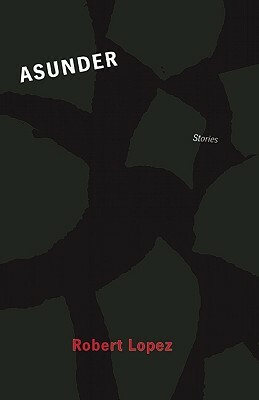 Like his previous works, "Asunder" is a study in the usage of language. Lopez carefully considers each word before leaving it on the page, and it shows. Robert Lopez: Robert Lopez is the author of the novels "Part of the World," and "Kamby Bolongo Mean River." His fiction and poetry has appeared in dozens of journals, including; Bomb, The Threepenny Review, The Mississippi Review, Indiana Review, New England Review, New Orleans Review, Blackbird, Nerve, etc. He teaches at The New School in New York City.